Selling in the Internet Age Book 2. 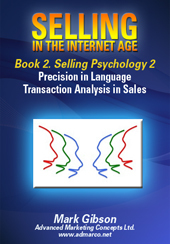 Selling Psychology 2. is about the use of language to create clarity and meaning in interpersonal communication and the use of Transactional Analysis to gain leverage and control in selling situations. In this book you will learn the Meta-model, which is a powerful linguistic model to create clarity in communication and how to drill through fluffy language to uncover meaning in buyer conversations. You will learn how people filter communication through deletion, distortion and generalization and to how to get to the deep structure of meaning and reverse buyer’s surface structure questions to understand context before answering. You will learn about “Meta-programs” which filter our perception and the “Hierarchy of Ideas” which in combination will improve your ability handle the most difficult communicators. You will learn about Transactional Analysis in sales and new techniques you can use to level the playing field with buyers. The tools in this book are powerful and require use of softening skills and rapport in their delivery and practice in daily use to master. Develop flexibility in reversing buyer’s questions to understand context and underlying issues prior to answering. Develop flexibility in communicating with extreme types in order to successfully facilitate group meetings and to chunk the buyer up or down as required for clear understanding.